Use pulsing action to process first 10 ingredients in food processor until finely chopped. Add lemon juice; mix well. Pierce chicken breasts with fork; place in shallow dish. Pour marinade over chicken. Refrigerate 2 hours. Meanwhile, combine Masala Coleslaw ingredients. Refrigerate 1 hour. Heat barbecue to medium-high heat. Remove chicken from marinade; discard marinade. Grill chicken 12 min. on each side or until done (170ºF). Transfer to plate; cover to keep warm. Drizzle oil over mushrooms and onions; rub with jerk seasoning. Grill mushrooms and onions 2 to 3 min. or until onions are caramelized. Remove from barbecue; slice mushrooms lengthwise. Mix dressing and garam masala until blended. 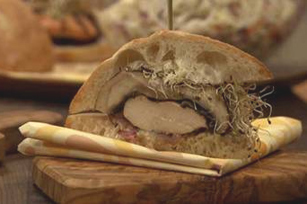 Spread buns with dressing; fill with chicken, mushrooms, onions and alfalfa sprouts. Cut sandwiches in half. Serve with Masala Coleslaw. Substitute 8 slices focaccia bread for the ciabatta buns. For more zing, add a splash of fresh lime juice to filling in each sandwich.